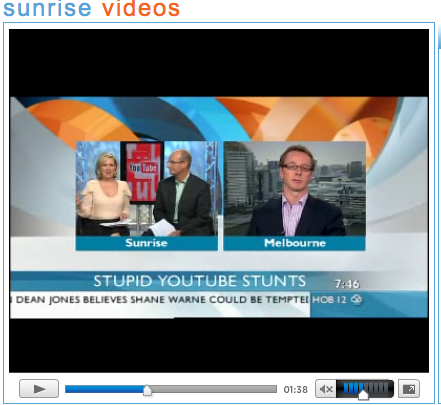 I was invited by Sunrise (Mel, Kochie et al) to offer my views as a “Social Media Expert” (is there really such a thing??) on why yoofs feel compelled to upload seemingly dangerous pranks and stunts to video sharing sites. I referenced University of California, Irvine researcher Mizuko Ito’s team who claim that the reasons include: lets them grapple with new social norms, develop technical skills and explore new modes of self-expression. The 2008 research also suggests youths use online networks to extend friendships and be seen as being “always (sic switched) on” for their pals and peers. In social media, Mizuko says, teens find opportunities to publicise and distribute their own ‘work’ and gain new forms of visibility and reputation. The studies also say that kids love digi-media as it allows for greater freedom than they’d normally get at school environments. I’d add too, that the kind of reputation kids seek via prank content, is one of dangerous, risk-taking badasses, surely? Concise message Gerry, good to hear you cut through the breakfast show hyperbole. As you touch on, it’s also about creating stories that can be shared. It just so happens that rather than “telling” the story themselves, they can now upload it to youtube and have their friends see, participate in and distribute the story for them. It’s like being Rupert Murdoch on L Plates. Ta Gavin; or like CB radio on steroids! Well said Gerry, being a recently retired youth, YouTube is an excellent outlet for anyone anywhere in the world to share a little bit of their individuality with the public and get feedback from them. This is because the youth generation is all about me, me and me. But this is not their fault, I think it’s because everyone is living in a narcissistic world; I blame social media outlets for this, like Twitter and FaceBook that allow you to update your status about anything; for instance, what color of socks you put on this morning.